2014-08-20 00:00:002014-08-20 00:00:00https://quickbooks.intuit.com/au/resources/product-updates/iphone-ipad-apps-updates-that-help-you-get-paid-quicker/Product UpdatesEnglishhttps://quickbooks.intuit.com/au/resources/au_qrc/uploads/2017/01/IPAD-IPHONE-UPDATE.pnghttps://quickbooks.intuit.com/au/resources/product-updates/iphone-ipad-apps-updates-that-help-you-get-paid-quicker/iPhone & iPad Apps – updates that help you get paid quicker! iPhone & iPad Apps – updates that help you get paid quicker! We know that as a small business or an accountant or bookkeeper, you’re not always working from your office. You’re out at meetings. You’re working from home. You’re picking up the kids. You’re commuting to and from the office. This means you need to be able to find easy, quick ways of working on the go. Enter our our QuickBooks Online iPhone and iPad apps! They’ve got the same modern look and feel of QuickBooks Online and, like the original, are being updated all the time. Here are some of the latest updates we’ve made to help on those days when time at your desk is a luxury. It should be easy for your customers to view and of course pay your invoices online, so the iPhone and iPad apps include a great invoice emailing experience for you and your customers. Sending emails through your iPad or iPhone app is simple. Just set a custom, default message when you send emails and customise the originating email address. 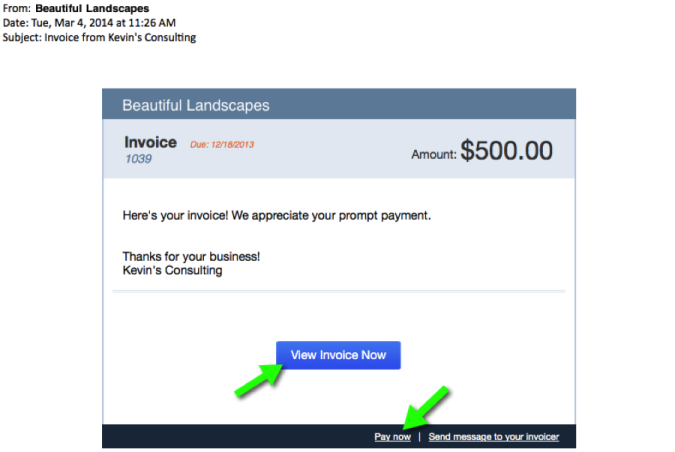 From your invoice email, customers can click View Invoice Now to view invoice details and save it. Pay Now lets them immediately pay you from their phone, tablet, or computer! An example of an invoice email. Track invoice views and get paid faster with this format. In the menu there is a tab called Products and Services. Here you can look through all of the products and services you offer and add new ones to the list while you’re on the move! Remember to update your apps so you are always working with the latest version. And the feature that you’re looking for isn’t in these most recent updates, fear not, we’ve got a lot in store for these apps coming soon! For more on QuickBooks Online and why small businesses are loving it, head here and read the latest product comparison research we commissioned.